Can whole-body MRI be used in oncologic staging? October 23, 2018 -- Offering similar performance to PET/CT but without requiring radiation dose, multiparametric whole-body MRI could feasibly be used for staging metastatic lesions and evaluating treatment response in a variety of cancers, according to a study published in the November issue of Academic Radiology. Researchers led by Michael Jacobs, PhD, from Johns Hopkins University School of Medicine found that multiparametric whole-body diffusion-weighted imaging (DWI) and apparent diffusion coefficient (ADC) mapping with T2-weighted MRI at 3 tesla offered 96% sensitivity for detecting bony and visceral metastases in breast, prostate, pancreatic, and colorectal cancers in comparison with CT.
"Whole-body MRI can be tailored to fit the patient, such that an 'individualized patient sequence' can be developed for a comprehensive evaluation for staging and response during treatment," Jacobs and colleagues wrote. For almost two decades, PET/CT has been the modality of choice to stage tumors, measure their metabolic activity, and assess a patient's response to treatment. PET has its limitations, however, and there's a need for an imaging method that achieves global tumor assessment and accurate lesion detection for greater confidence in the detection, characterization, and monitoring of treatment response in metastatic disease without increasing radiation dose, according to the researchers (Acad Radiol, November 2018, Vol. 25:11, pp. 1405-1414). 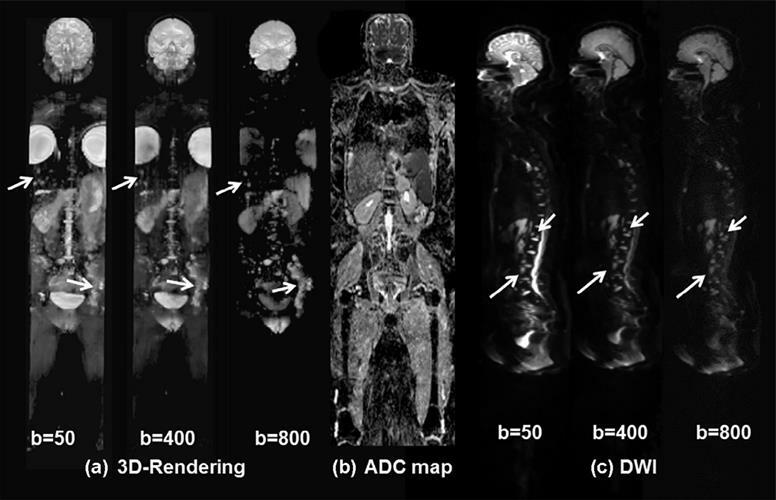 In their prospective study, the researchers implemented multiparametric whole-body MRI, coupled with DWI and quantitative ADC mapping at 3 tesla, to provide functional and quantitative information about normal and tumor tissue. They then compared the whole-body MRI results with those from CT or PET/CT. "This development of quantitative MRI provides the opportunity to investigate the detection and characterization of metastatic areas in the body without the need for ionizing radiation," they wrote. The researchers enrolled 32 normal volunteers and 22 patients with stage IV cancer who were scheduled for PET/CT imaging. Whole-body MRI scans were performed on a 3-tesla system (Magnetom Trio, Siemens Healthineers) with a protocol that included whole-body axial, coronal, or sagittal imaging with fat-suppressed short-tau inversion recovery (STIR) T2-weighted images and DWI. PET/CT scans (Discovery LightSpeed, GE Healthcare) were conducted after injection of weight-based doses of FDG or carbon-11 choline. Whole-body DWI of a 46-year-old woman with metastatic breast cancer includes 3D visualization of metastatic lesions (a) using different b-values from DWI. There are progressive changes in the DWI signal intensity within the metastatic sites (white arrows) of the left pelvis, thoracic and lumbar spine, and liver. Also shown is a coronal ADC map (b) through the midsection of the patient. Different b-values from DWI sagittal images (c) of the spine show multiple metastatic regions. Images courtesy of Academic Radiology. PET/CT detected a total of 91 lesions throughout the body, with most of them discovered in the spine, pelvis, and liver. By comparison, whole-body T2-weighted MRI detected 88 (97%) of the 91 lesions, while 87 (95%) lesions were detected on whole-body DWI in the axial plane and 84 lesions (92%) were found in the coronal plane. The combination of T2-weighted images with DWI-ADC mapping yielded 96% sensitivity, according to the researchers. In other findings, ADC map values and the ADC ratio in metastatic bone lesions were significantly different (p < 0.002) than in normal bone. They were also lower in metastatic lesions than in normal soft tissue.